This is a short post to let you know that I’m running a short hand drawn map workshop at ONCA Gallery in Brighton alongside the exhibition ‘The Long View’ by somewhere-nowhere. For adults of all levels of artistic experience. By the end of this 2 hour workshop you will have all the skills to make a basic hand drawn map! Please bring a notepad (or equivalent), a pencil, a ruler and clothing appropriate for taking a short walk outside. Then stay and enjoy The Long View exhibition in the gallery. Travelling to Mexico on the information highway. It’s funny, as an illustrator, how many places I visit before I create a picture. And by visit, I mean metaphorically travelling down a fast paced information highway, halting occasionally at random pitstops for a quick look around or perhaps, a longer stay. Throughout my career, I’ve visited many locations, hiking the snowy wastes of Greenland, schlepping through the deserts of the Middle East and wandering the streets of Beijing, all via a screen in my studio. This post is about approaching the internet with an explorer’s curiosity and how it can lead you to creative inspiration. 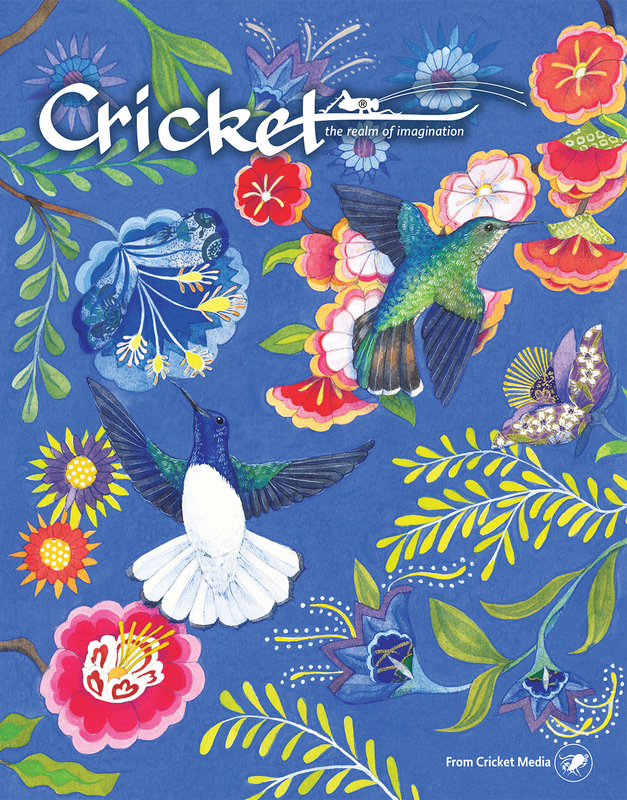 Back at the end of last year, I was commissioned to create the front cover and contents page of the May/June issue of Cricket Magazine, an illustrated publication for children in the States. 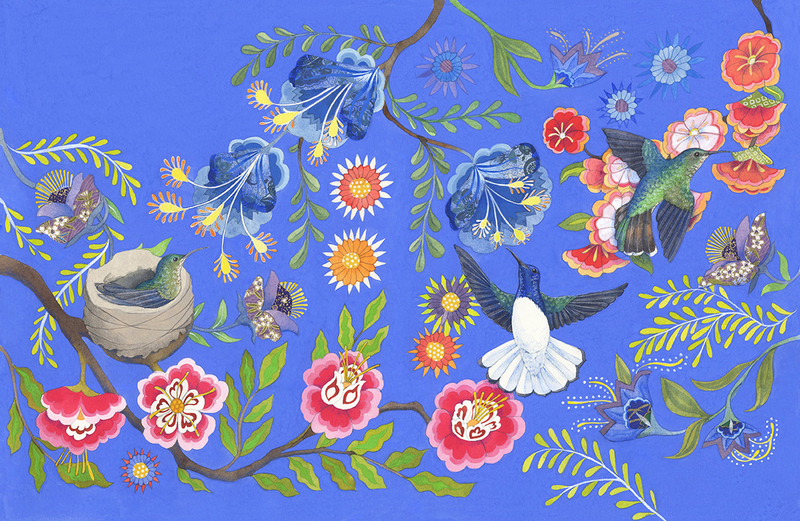 The theme was ‘Hummingbirds’ and even for a small project like this, the journey was no different. I have never seen a hummingbird in real life so I started the project with some rambling research, opening creaking digital doors and exploring little known cyber pathways. As usual, I was sucked down an internet vortex leading me to unfamiliar worlds. There were steamy jungles, brilliant blossoms and tiny hovering birds, far from the familiar wrens and robins of the English garden. The lime greens of the feathers and the hot pink of the flowers reminded me very much of the colours found in folk embroidery, from Russia in the North to Latin America in the South. I set sail on more random research adventures and landed up on the warm shores of Mexico, home of an incredible textile culture. Elvira Gomez. Photograph by Thelma Datter. 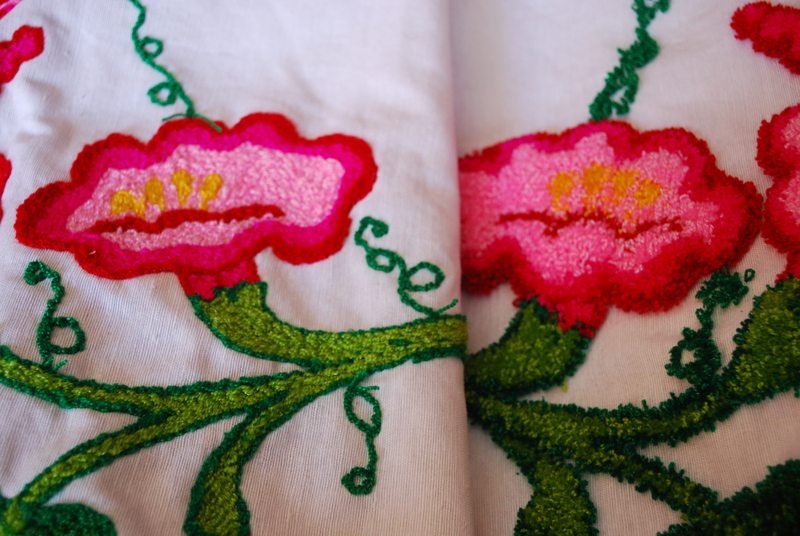 Mexican folk embroidery has been in existence from pre-hispanic days, developing centuries ago from its roots with the Mesoamerican Otami peoples into the form today known as Tenango. 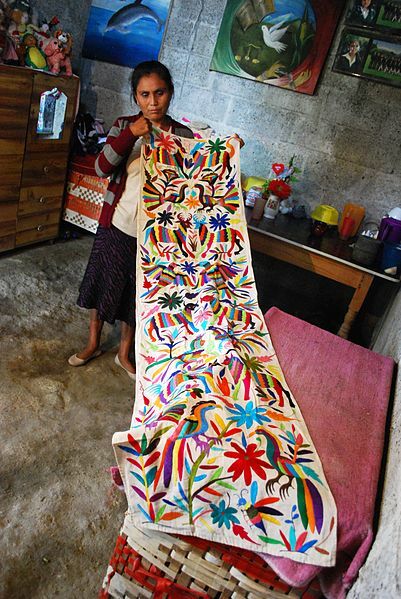 It features the flora and fauna of the region in unreal colours and geometric patterns. Broad flat stitches neatly cover the cloth and larger pieces can take years to complete. 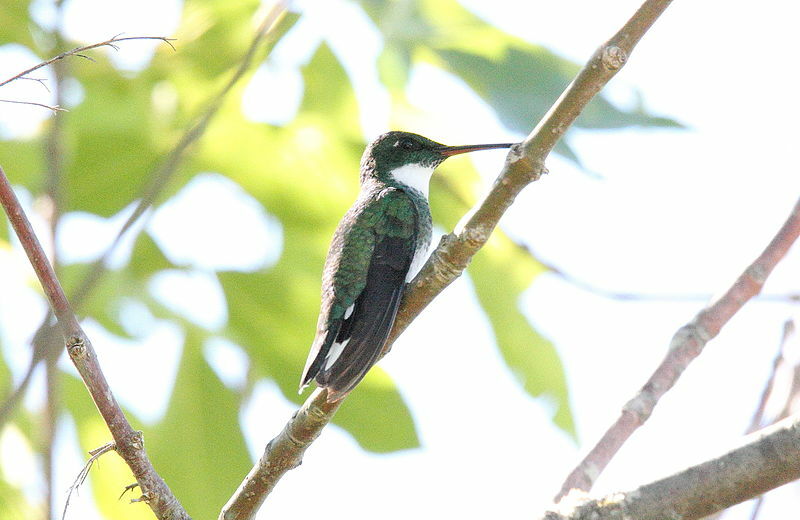 Mexico is also the home of the white throated hummingbird. It’s a beautiful thing when two paths converge. By exploring, allowing myself to travel without boundaries, I had found connections between two diverse subjects and a way to visualise and create something new. White throated hummingbird by Dominic Sherony. With Mexican embroidery as inspiration, my pages became filled with twirling blossoms, their distinct shapes, a useful foil for further patterned collage. The hummingbirds danced above them, drinking their nectar and making nests in their magenta petals. 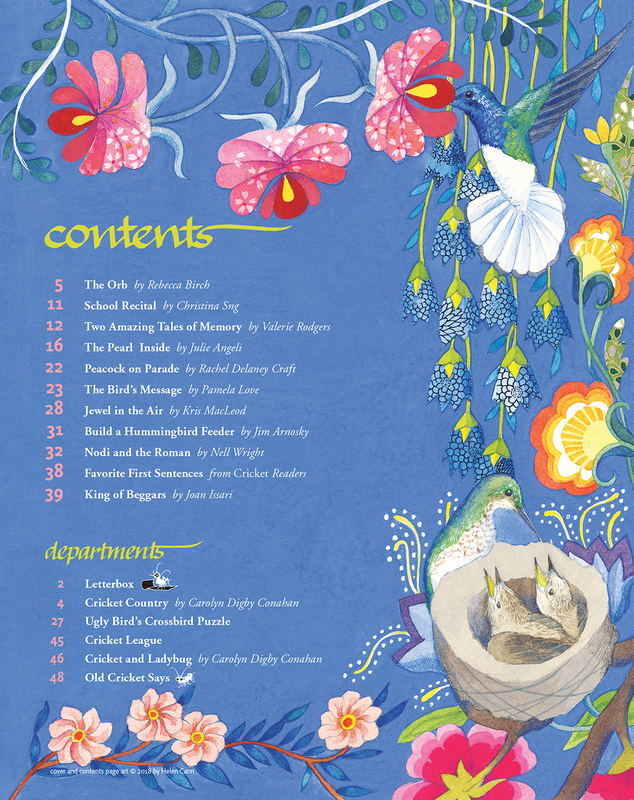 I wanted the whole image to become a riot of blooming decoration where botanics and birds took equal precedence in the pattern. So it’s with the publication of this month’s Cricket Magazine that my short metaphorical stay in Mexico is done. I’ve come away with small souvenirs of understanding and a place to return should I ever need inspiration for beautiful bright birds and flowers. The internet is my ticket to travel. It allows me to reach places I have little knowledge of and, if fortune smiles, lets me leap across subjects and make creative connections. Despite all its faults, it’s a vital tool in the illustration suitcase. As I look out on my very English garden today, relishing the May warmth, the sky is the palest of blues and the lilac tree, a delicate mauve. It’s certainly good-looking in a reserved, polite way but there’s a large part of me that would like to see the joyful pink of the hibiscus, the shocking blue of a hummingbird and the unapologetic azure of a Mexican sky, not just captured in pixels on a screen, but for real one day.